Reduced-power springs provide a 3.5 pound trigger pull when used with J.P. triggers, and a pull of 4.5 to 5 pounds when used with standard trigger components. Includes hammer spring, trigger return spring, and disconnector spring. Installation instructions also explain engagement surface polishing to obtain a smooth, reliable trigger. This spring setup will give good ignition reliability with domestically manufactured ammunition and properly seated primers. Do not use foreign-manufactured ammunition because the primers in such ammo are often extremely hard and will give poor ignition with this spring kit. 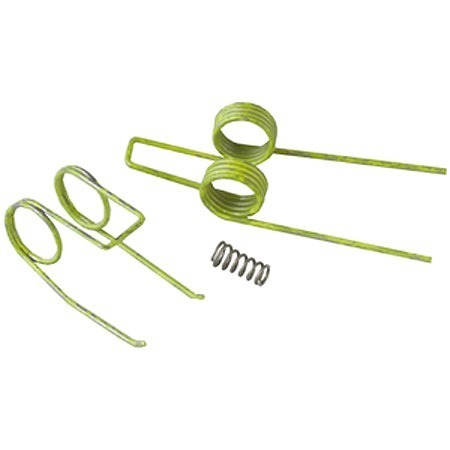 These springs are designed for recreational use ONLY and should NOT be installed in a Duty or Home Defense firearm where reliability is foremost. SPECS: Steel, yellow-coded hammer and trigger springs. Paint may flake off. Reduziert-Power-Federn bieten einen 3,5 Pfund abzudrücken, wenn mit J.P Triggern verwendet und ein ziehen von 4,5 bis 5 Pfund mit standard-Trigger-Komponenten verwendet. Enthält Hammer Frühling, Trigger-Rückholfeder und Disconnector Feder. Installationsanweisungen erklären auch Engagement Oberflächen Polieren, um eine reibungslose und zuverlässige Trigger zu erhalten. Dieses Frühjahr-Setup geben gute Zündsicherheit mit im Inland hergestellte Munition und korrekt sitzende Zündkapseln. Verwenden Sie ausländischer Produktion Munition nicht, weil die Zündkapseln in solche Munition sind oft nur sehr schwer und schlechte Zündung mit dieser Feder-Kit geben werden. Diese Federn sind konzipiert für den Freizeitgebrauch nur und sollte nicht installiert werden, in einer Pflicht oder Home Defense Feuerwaffe, wo Zuverlässigkeit die wichtigste ist. Angaben: Stahl, gelb codiert Hammer und Trigger-Federn. Paint may flake off. Helps the factory trigger out a ton! With this spring set, a factory trigger can actually be pretty good. Make sure you use some of their trigger prep grease as well. I have these installed in all my AR rifles and have never had a light primer strike or any other issues. This is now my 3rd AR with these trigger springs and I love them. Can't beat the price and quality!! These springs are really good springs for dropping the lbs. of trigger pull on a stock trigger to approximately 4lbs. But DO NOT use these if primer ignition is a critically issue. While using these springs I have had about 25% light primer strikes and non-ignition of ammo. Ammo Tested: Federal, Remington, Hornady, Lake City, and Custom Reloads. I like the reduction of the pull but suggest not to use in any serive rifles, just plinkers. Also If you are planning to use this with a .22LR conversion kit DON'T waste your time you will have a failure to ignite rate of about 40% - 50%. JP tech support really took care of me today. They helped me realize I put the hamer spring in backwards and took me step by step through getting it fixed. Since I put the spring in backwards the hammer didn't strike the firing pin hard enough and I had misfires. With JPs help I quickly fixed the problem. The trigger pull is so much better with JP springs! I put these springs on all my AR's. I know people who cut down factory springs or only hook one leg of the factory spring to reduce pull weight. These springs make a cleaner more balanced trigger pull - for pocket change! Accuracy improves because of shootability. I always recommend these to people on a budget. Used this kit in a lower dedicated to a Tactical Solutions .22 upper and so far it has been great. I have had only a few failures to ignite on primer strikes and that could be due to the Federal bulk ammo. I think that's awesome out of roughly 1000+ rds already. Not as good as a custom trigger but, not the cost either. I also used a sharpening stone on the nose of the trigger to smooth out the finish and get rid of tool marks. Just guessing; its about 4 to 4.5lbs now. Before you spend any money upgrading your stock AR-15, buy this and put it in. Even witout buffing anything, it took my stock 10 lb pull to 3.5 lbs. That is better than most match grade triggers that cost between $130.00 and $290.00. It only took 10 minutes. and no special tools. These springs will be in every AR I buy!! have not had a ftf and cut my trigger pull in half on dpms sportacle. only took 10 minutes with a drill bit and a small hammer. Installed a spikes .22 conversion in a 7 1/2" pistol. Had about 75% function. Installed this light spring kit and am close to 100% with all issues associated with ammo. Spikes had told me I would have trouble getting reliable function with such a short barrell, but after this kit, I'm happy! I was not willing to drop $120+ on a trigger kit for my "low cost" DSC AR-15 (btw, it's a well-made AR and doesn't cost a lot). So I take a gamble on this springs. Wow, the difference was night-and-day! The trigger pull is so much lighter and still smooth with no creep! With this springs install, my AR still can handle the cheap Tula ammos with no problem. Then I swapped out the bolt carrier to a CMMG stainless steel 22LR conversion kit. It still worked like a charm! I ran 100 rds thru it, every round went bang without a hiccup. I was using the cheap Winchester 555 box of 22LR ammos. For [$], why not give it a try! I'll throw my endorsement on top of everybody else's. Installation was quick and easy on a Stag lower, you just need a punch or drill bit and a hammer. I also polished the sear-hammer contact surfaces with a dremel tool before reassembly. The result was a lighter, smoother trigger without paying a lot. I tried it with all kinds of ammo, Winchester, Federal, PMC, and even Wolf (which allegedly has a hard primer). 100% ignition every time after 300 rounds. Groups tightened up nicely, too. I had to give it it 5 stars for what a considerable difference it made in trigger pull for the price. While its true that it may not reliably ignite military cartridges, I had zero failures of any kind in my BCM 16" mid-lenght W/stag lower and DPMS mil-spec parts kit. I tested mainly federal 55gn fmj, but also had no problems with Fiocchi 62gn fmj, Federal XM855 62gn steel core, and BVAC 75gn 5.56 tactiacal HP. If your rifle only sees range time, it's definately worth a try over the price of a match trigger. I was looking for a budget trigger mod for my AR and I found it here. I will say that the trigger pull is almost TOO light. It definitely qualifies as a "hair trigger", and it is very easy to accidentally bump fire. I would definitely not recommend this to someone new to shooting. However I have shot about 250 rounds of different kinds of ammo (both cheap and expensive) and have had ZERO failures or light strikes. Easy install for my Sabre. Took it to the range last weekend with wolf ammo and I had no misfires. There was a noticeable difference in trigger pull but not like a full drop in trigger. For the money it was a great and easy install. Also I did not have to polish anything. I installed the spring kit on a budget build varmint AR. I bought a Delton lower (very nice) and a parts kit with a heavy barrelled upper. Great kit but the trigger pull was terrible (7-8lbs). I installed the kit and now it has a 4 lb trigger. Installed this spring kit on my DPMS LPK. Trigger went from 5+lbs to 3.5lbs. The trigger still has alot of takeup, but the pull weight is now alot more conducive to accurate shooting! I am extremely pleased with the results! Okay I installed these today soon as UPS showed up. My honest opinion of these could not be better, these will not take away a long travle or the grit and grind some of you might feel, but they will make a slightly cleaner break in your trigger. Now dont install these expecting a Wilson combat TTU trigger feel ( In my mind that is the BEST trigger you can buy. Bar NONE) but if you want a easier pull and a slightly cleaner break these are what you're looking for. If you dont like them......it was [$]!! Cant go wrong either way. I own 6 of these kits. Every one of my ARs are now very pleasant to shoot. It's like an instant trigger job! If you know how to assemble a stripped lower, you can install this. It's not difficult. There are may YouTube videos on how to do this. The only negative is that when you shoot surplus ammo or ammo with known "hard primers", you may get a failure. I ran into this when shooting some Wolf Ammo. Remember, a lighter spring will make the hammer fall with less force, so it will have a lighter primer strike. Only use surplus ammo for plinking. I put this in my AR and polished the stock trigger parts. I find that the quality of trigger pull is comparable to that of a drop in kit that my buddy paid $200 for. Maybe not exactly as good... but it makes me smile!!! Light trigger pull on my AR and easy to install. Prior to change trigger pull was 3 1/4 lbs in my S&W MP15 22 that had been worked on after change over it went down to 2 1/2 lbs. Doesn't get any better than that. No complaints. Did not use the small coil sear spring wanted to stick.Gun works fine with spring kit. YEP.... its true!! after shopping around for 2 weeks i decided to go with the jp3.5, for my ruger sr-556, after a failed cmc drop in trigger (save you're money). easy to install and great results!!! for only a [$] purchase. Thought I would try it since it was so inexpensive before dropping the $$ on a Geissele. Purchased and installed the spring kit on a Spikes Tactical LE-M4 AR-15.Installed and dry firing was impressive! Quite a bit easier trigger pull compared to OEM MilSpec springs. Hammer *seemed* a little light, but I had both commercial (American Eagle 223) and MilSpec 556 (XM193 LC NATO) ammo to try.Loaded up the AE and first shot went click. Nothing. Checked the round and saw the dreaded light primer strike. Did not ignite the round and I did not even attempt to try the XM193. Changed out the springs to OEM and started my range day. 100% failure = 100% NFG.At least it was inexpensive! Shipping cost not worth while to return to Brownells. I guess it goes into the parts bin. I can always use a spare sear and trigger spring in case of loss or damage.On the bright side, I now have a Geissele SD-E on the way from [@]! This is for the guy that wants a better trigger without spending $200.00. Makes a nice difference in trigger pull, better than stock. I OWN A BUSHMASTER E2 AR-15 THE STOCK TRIGGER IS JUST THAT STOCK. WITHOUT SPENDING BIG DOLLARS FOR A NEW TRIGGER I THOUGHT I WOULD TRY THIS SPRING KIT IT WENT WITH NO PROBLEMS. I COULD NOT RATE IT A FIVE BECAUSE IT WOULD NOT BREAK WITH FACTORY PARTS AT 5 LBS IS WHAT JP SAID IT WOULD. OTHER THAN THAT TIME WILL TELL. I bought this just because I had bin lookin for a new trigger for a while. And it was so cheap I said why not just try it. I didnt think I'd feel much difference in the trigger. But holy smokes I did and now I have to get one for my Wifes AR. Great product, did what it was advertised to do. Installed in my AR15 and trigger pull dropped from 7-3/4 lbs. to 4-1/4-1/2 made a huge difference to my trigger. Just received these and installed in less than 5 minutes. Trigger pull is now 4 1/2 lbs. in my m&p sport. I did not do any polishing but did add a dab of sta-lube to directed points. Still has a bit of take-up but feels much better than stock. I fired 5 quick rounds (A.E. 55fmj) in my yard and had zero problems. I am planning on running a few hundred rounds this weekend, I will update if I notice any problems. May still send assembly to Bill Springfield to address take-up, time will tell. My M4 had a 5.75 pound trigger pull, after changing the Springs, I now have a 3.75 trigger pull. A 2 pound difference in less than 15 minutes, including reading the directions. Why buy anything else, outstanding product. I have these springs in all of my AR's and have put them in AR's for friends. We all love them. Been using them for about 5 years with no issues at all. I took advice from my buddy who works for DPMS, on improving the trigger rite away after purchasing a new rifle. I got sticker shock when looking at trigger/hammer assemblies, then I saw the spring kit for [$], I figured it's worth a shot and a whole lot cheaper than $250! I put them in and went straight to the range, wow, just wow, what a difference! I've been talking to all my buddies with AR's (as a matter a fact I just purchased a set for my brother in law). They are so easy to install, but my buddies want me to put them in lol (maybe a new gunsmithing career lol), best [$] I've ever spent! I replaced the factory trigger springs on my Smith & Wesson M&P 15-22 with these J P Enterprises springs. Easy and fast install, works perfectly! Well worth the [$](+shipping)! Cut trigger pull in half. Over 1K of Fed XM193 with no problems. For the money, you can't beat these springs. On my bushy the trigger pull went from 8lbs to about 4 1/4lbs. I did use some carb cleaner to take off the flaky yellow paint. Because I have many rifles, drop-ins are not financial feasible. The install was easy for a novice, like myself. This is a fantastic set of springs. Added it to an ALG ACT combat trigger, and man is it smooth and crisp. It was very easy to install, removed the original springs and just snapped the JPE set in their place and installed the new trigger setup in less than thirty minutes start to finish, really made a world of difference. I just installed these springs the other night and spent about 3 1/2 hours with some 1200 wetstone sandpaper and a ultra fine/polishing stone. I also used anti-seizure grease at all contact points and ended up with a smooth, NO CREEP, very little take up trigger pull that averaged 3lb 14oz on my Lyman trigger scale. Absolutely magnificent for [$] and a few hours of hand labor. Since these were Mil-Spec parts I kept, I did not remove any metal or change the dimensions in any way on the trigger, hammer and disconnector. But you could almost see your face in the hammer it was polished so smoothly. I have not shot it yet but will be taking it out this weekend and have high hopes after pulling 9 1/2 lbs for the past year. I have not had the money to spend on a drop in trigger set as I have other priorities such as firearm tools as I am learning to become a gunsmith and Duracoat specialist. If these springs present any reliability or ignition issues I will report back . I have bought and installed a half dozen of these and have never been disappointed. Claims 4.5 pounds with stock trigger, but I have seen some as low as 3.75#s with stock trigger. Never had a light primer strike or any other type of malfunction. Excellent product for the money. My first AR. A RRA Lower. The shop had a lower with a bettter trigger feel, but the brand was ???. I had to smooth both the trigger and hammer fit and with the instlation of the springs the trigger is now butter smooth and probably in the 4-5lb range, down from what I would guess was 8-9lbs. I am very satifified. The springs will only lighten the feel, they will not remove the gritty feel. That is caused by the maching of the trigger and sear that you will have to polish out. drop in installation, works as advertised, very noticable improvment. i considered buying a drop in trigger group , but wasnt willing to pay 200 to 300 bucks for one, this one works great, and its a fraction of the price. used it with my standard trigger group, LOVE IT ! I have installed these in 12 rifles with stock trigger groups and done the "set screw trigger job" and all the owners of the rifles compare them to any of the high dollar drop in trigger kits. Had no problems with FTF on military or bulk ammo. I was a little skeptical at first, as the rifle has had some issues with failure to detonate the primer 100% reliably in the past. I dropped this kit into my AR at the range after firing a couple clips with the OEM springs. I was thrilled to find all the creep was eliminated from the trigger. The JP Enterpises spring kit give your trigger a nice smooth pull followed by a lighter, yet crisp and consistent snap. After a couple hundred rounds, reliability was still 100%. You won't get a more finely tuned trigger for less work or money! I am giving a five star without a test shoot. They are excatley as described. Got a pull of 4.3. Now instead of a polishing I used EWG on all pins anywere there is metal to metal. The pull is like it is not there. Put in a fired shell and I got a clean dimple. Very nice and light trigger pull with this kit, and with bobbing the hammer and polishing the pins and contact points on all trigger group components, I still have super strong pin taps without a failure on any brand ammo, commercial or mil surplus. Totally worth it! I put these in my ar build and had FTF on a variety of ammo of varying qualities. Could not trust the gun to fire with them. I put the old springs back in. I have installed a number of these kits now to a few different makes of AR15's, All with very pleasing results. Along with a honing/polishing job on sears and installing adjustable travel screw the triggers are certainly completed with this kit. Working the kids up from the .22 and they were having problems with the stock GI trigger. A little polishing compound and the addition of these springs have made a significant improvement. Excellent upgrade. I used these springs with a RRA two stage match trigger. With a little filing and polishing I was able to get a consistent 1.5lb pull. and after watching about a dozen you tubes on installation of this product, it just does not get any easier. What a difference on this spring kit. The hammer fell right around 4.5#s. That is a big difference from the factory pull of almost 9#s. The installation was on a 1990 Colt Sporter Target Model. A great fix for under 20.00!!!!!! I should have bought two of these. 0 issues with ammo going bang! At this early stage I can say it's a great set-up with a 3.8 lb trigger break on a Rock River two stage. Just installed, excellent upgrade! Can't wait to go shooting. It's a great set-up and trigger break on a Bushmaster two stage, over stock OEM MilSpec. Followed the directions/youtube video and it went in like a breeze. Applied some anti-sieze like the instruction said and the break was buttery smooth. I should have bought this sooner! *Opinion & Rating may change if I encounter issues when shooting. I installed these springs in my wife's Bushmaster Carbon-15. I was amazed at how much nicer the trigger was after. Very simple installation. Significant improvement over the gritty stock trigger pull. WOW, what a difference. I used a cheap parts kit for my pistol build, the ridiculous stiffness of the hammer spring was causing some drag issues, short stroking and occasional disconnector fails (hammer following the bolt) This kit from JP fixed my problems and gave me a much improved trigger. I plan to order the JP fire control group and speed hammer later on. Good Stuff! I've used 4 sets of these so far. With the most recent set I was jabbering too much to the peanut gallery and assembled the lower with the stock springs. First trigger pull told me something was really wrong. I swapped the springs and viola! Gave me a nice comparison. I have 6 more sets on order. Installed in an old Colt H-Bar Sporter Match gun. Results were better than I expected. The only thing wrong with my originial trigger was it being very heavy; it had little to no creep or roughness. The spring kit made the trigger feel almost as good as the timney that I have in a Ruger AR556 (M4 style). That gun needed more than springs as the trigger had roughness issues along with creep and being extremely heavy. If you install in a Colt or any AR with a sear block you must replace the safey prior to installing the trigger. That would have been good to know. I use this on a .556 Daniel Defense DDM4V11 lightweight rifle. The trigger from the factory was a very heavy, gritty, mil spec trigger that I thought I'd need to replace. A guy on the forum recommended this, so for 10 bucks, I decided to give it a try. I followed JP's instructions of prepping parts with light polishing. I erred on the light side of polishing as to not damage the thin layer of hardened steel.I then used Brownells action grease on the contact surfaces of the ignition group. The trigger is now very very nice. No grit, much lighter(guessing 4 to 4 1/2 lbs). I've shot 120 rounds of reloaded ammo without single light primer strike or malfunction. My expectations have been exceeded. Last note, J&P rep told me not to use on hard primers such as found on steel case ammo. Drop in takes just minutes. Makes a HUGE difference. Definitely going to keep several on hand for customers!!! I bought this kit to use on my AR15 Pistol Build. I have a regular AR trigger set that had be polished and coated in nickel boron (by another company). When I installed this kit with the trigger set it didn't have enough spring strength to fire the rounds, so I replaced the spring kit with the regular springs and everything worked fine then. Maybe if you have an enhanced trigger set (that has a smaller hammer) this might work. I can only tell you that it was a complete bust for me. Put this trigger in a TSAR 300 Blackout and I must say its the best money spent on improving the feel of this trigger. Smooth and crisp! Trigger pull before installation averaged 6lbs-13ounces. After installation average trigger pull was 6lbs-3ounces, a reduction of 10 ounces. I was expecting a little more reduction, although not bad for the price. Pure and simple, best and easiest improvement to an AR for $10. Considerably smooths out the trigger pull. Got this in all of my ARs as a standard. Unless you're building a race gun for competition or a super accurate "sniper" rig and will choose one of the many expensive custom trigger sets, this one is a "no-brainer"
I just installed my 10th set and ordered 5 more. On some guns it makes more difference than others. I always polish the trigger and hammer mating surfaces so some of the improvement may be there. The one I just installed for a customer took the trigger pull from 7 lbs 11 oz to 4 lbs 10 oz. Worthwhile in my book. Easy, inexpensive upgrade that doesnât kill the wallet. Cut my trigger pull in half. Trigger polishing is a must. I would recommend these to anyone with an inexpensive ar platform who doesnât want to spend half the value of the gun on an aftermarket trigger. I took my rifle to the range and ran 120 rounds of mix match loaded mags without a problem.